Woah I’m coming over all American! But I couldn’t think of a catchy title with Blemish in it! We all get spots from time to time, but fear not because there’s a few simple tricks which you can use to help banish the blemish! It might be that your skincare is too harsh, and irritating your skin. Scrubs can spread bacteria so instead, choose a gentle peel with fruit acids and enzymes to draw impurities, such as Merumaya’s Exfoliating Peel. A deep cleansing clay mask also treats skin, especially those with salicylic acid. My favourite masks include Aesop’s Parsley Seed Mask, and their Anti Blemish Masque which instantly soothes redness. Also in my anti-acne kit is the Origins Super Spot Remover to target the blemishes directly, and for night time, Malin + Geotz active sulphur Acne Treatment which rapidly heals and repairs inflamed skin. For dull skin, a hydra facial is a great option as it deep cleanses but doesn’t use harsh chemicals. The HydraFacial at Beyond Medi Spa is one of my favourites. For really severe blemishes, a medical type facial is best. The Dermalogica BioActive Peel cleanses, opens pores and then peels up to 5 layers of skin to reveal a fresh renewed complexion. If you’re not sure what your skincare concern is, then the Darphin Facials begin with a thorough consultation and each facial is built for you and you alone, no huge menu to choose from, just a bespoke facial. Oh, and they are the most relaxing experiences ever! If you layer up lots of foundation and concealer, a build up of oil can block pores. Mineral powders and concealers with fine pigments such as Clarins Concealer Stick will cover up blemishes without causing a build up. Taking vitamins and minerals also helps. Zinc especially can help to combat bad skin, and of course, drink lots of water. It’s one thing I’m bad at, but this year it’s a NY resolution I plan to stick with! 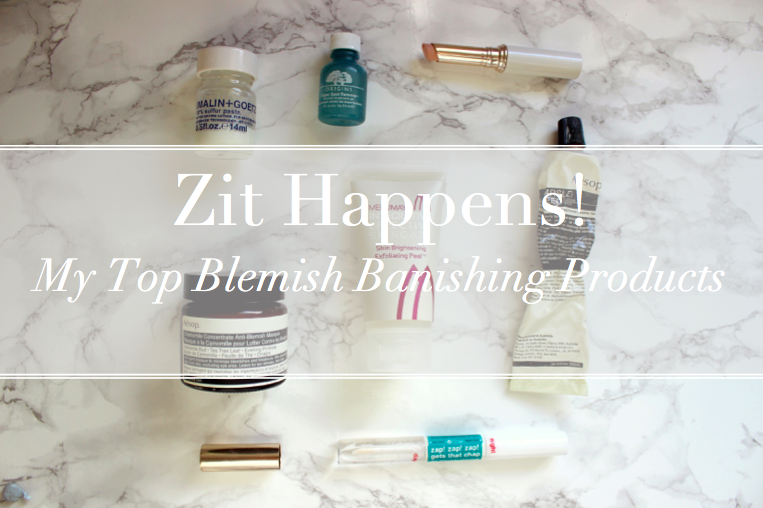 What are your blemish banishing tips?